Social Media | Marketing Plan Strategy | "Getting a quality website is an investment not an expense." I’m amazed how many people contact me asking how to integrate social media into their marketing plan. They read so much about social media and now they want to put it front and center on their plan. They want to use social networking as the tool that brings in all this new business to their company. But, our philosophy here is research. With proper research and then we can determine the proper plan. 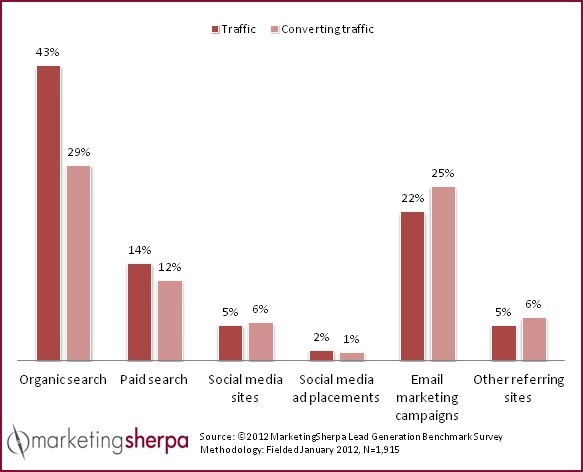 A new report from MarketingSherpa shows where we should put our priorities. The two areas that make the most difference are organic search and e-mail marketing. As you can see from this chart, social media ads are almost worthless. Social media is probably one of the worst return on investments a website owner can make. Now that’s not to say that some industries might do very well in social media. If you’re selling cosmetics to teenage girls, social media might be the right place for you. If you have a Non-Profit organization, social media or Facebook is one of the best places you can be. But for the vast numbers of website owners, organic search and e-mail marketing should be their strategic plan. For a long time we have said that paid search does not convert well. It’s the least attractive way to get traffic to your website. And that traffic stops the minute you stop advertising. People should use their time and money wisely and build a website that is going to deliver organic search traffic over the long term. They should take the time and build a strategic plan that incorporates offers to get e-mail addresses. With an e-mail database, you increase the conversions and profits. An e-mail list reminds people that you’re still in business a year later. Done properly it can incorporate the successful methods of drip marketing. It requires more work to have an e-mail list. It requires more work to put together a plan, a strategy for your clients. It’s more work to think about and research about the type of people who use your product and services. We break those people down into market segments, and then develop e-mail list to those segments, we will have even more success. These numbers in this research are averaged. There are some who were doing much higher in organic search and e-mail marketing. It our recommendation that website owners not use social media for a megaphone about their business. Social media can be a valuable research tool, to learn what your prospects or customers are talking about. It’s a good way to learn what’s important to them. But it’s not a good way to sell them. This chart in the research behind it covers hundreds of websites. Let’s not ignore this valuable research. Let’s stop wasting time promoting our products and social media. Contact us today to discuss how we can work together with you on a strategic plan for your website.